ATMOS POWER PVT LTD is leading manufacturer, designer and supplier of Pressure Vessel. We are certified ISO 9001:2008 and Manufacturing as per ISO coding. 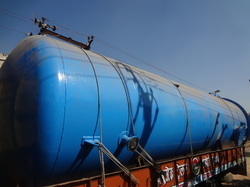 We Offering different capacity in pressure vessel as per client requirement. Pressure vessels are used in a variety of applications ranging from industrial compressed air receivers to domestic hot water storage tanks. Other examples include recompression chambers, distillation towers, mining operations, petrochemical plants, nuclear reactor vessels, submarine, space ship habitats, and storage vessels for liquefied gases such as ammonia, chlorine, propane, butane, and LPG. One key area where pressure vessels are critically important is in oil refineries where PVs are often pushed to their design limits as refiners try to maximize utilization and production of products like gasoline and diesel. In refineries, pressure vessels are employed in many different services, including storing feed and products as well as reactors, separators, and fractionation towers to name a few. ASME Boiler and Pressure Vessel Code: Section VIII: Rules for Construction of Pressure Vessels. As the pressure vessel is designed to a pressure, there is typically a safety valve or relief valve to ensure that this pressure is not exceeded in operation. As per standard design we are giving safety and drain valve for high pressure release. ATMOS POWER PVT LTD is leading manufacturer, designer and supplier of Air receiver. 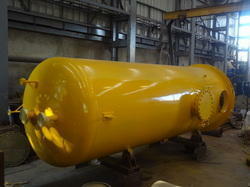 We offering Pressure Vessel with customize capacity. A pressure tank connected to a water well and domestic hot water system. A few pressure tanks, here used to hold propane. A unique application of a pressure vessel is the passenger cabin of an airliner. The outer skin carries both the aircraft maneuvering loads and the cabin pressurization loads. ASME Boiler and Pressure Vessel Code Section VIII: Rules for Construction of Pressure Vessels. As the pressure vessel is designed to a pressure, there is typically a safety valve or relief valve to ensure that this pressure is not exceeded in operation. Many pressure vessels are made of steel. To manufacture a cylindrical or spherical pressure vessel, rolled and possibly forged parts would have to be welded together. Some mechanical properties of steel achieved by rolling or forging, could be adversely affected by welding, unless special precautions are taken. In addition to adequate mechanical strength, current standards dictate the use of steel with a high impact resistance, especially for vessels used in low temperatures. In applications where carbon steel would suffer corrosion, special corrosion resistant material should also be used.